Dan Moore was sitting on his porch looking at the grassy park perched like an island in the middle of his street, Rutherglen Close. “Jeez, that would make a nice spot for a car show,” he said to friend and fellow car buff Garry Work. 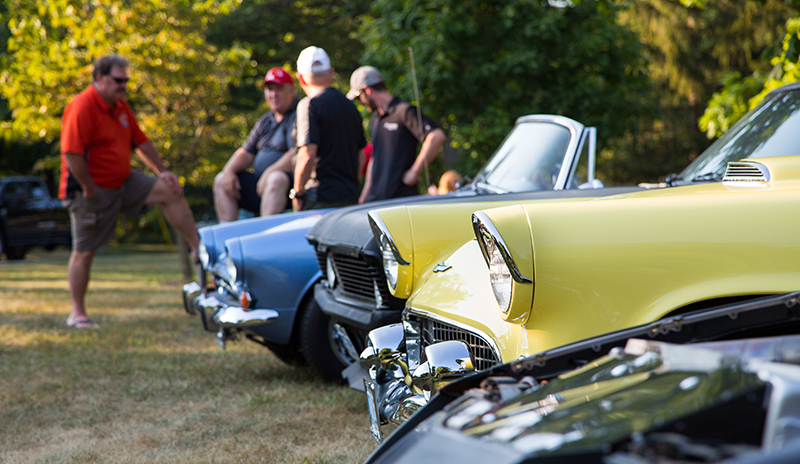 Today, Moore, Work and the other neighbours who encircle the north-end street are preparing to host their 10th annual Invade the Close Car Show on Sept. 15. Their initial concept of a British sports car event was quickly scrapped to include everything from American muscle cars and foreign classics to trucks and motorcycles. “Every car is invited,” Moore said. The first show a decade ago boasted 42 vehicles. Last year, 300 showed up and 350 are expected this year. “It’s been getting better all the time, and everyone seems to enjoy themselves,” Moore said. Anyone can enter a car for $10 that day and spots are granted first come, first serve. What makes Invade the Close unique is the commitment of the neighbours who collectively turn their front lawns into show space for cars and trucks. Work said newcomers to the neighbourhood embrace the concept, and as the number of vehicles increases each year so does the number of spectators. People tell him it’s their favourite car show of the year, he said. All proceeds are given to the Salvation Army, which operates a barbeque for the crowd. About $8,700 was raised last summer and this year’s goal is $10,000. Six trophies are up for grabs for the exhibitors with the residents of Rutherglen picking the winners. A tent and stage will be set up where Work will play music from the ‘40s to the ‘90s. Invade the Close is a go rain or shine, Moore said. WHEN: 10 a.m. to 3 p.m. on Saturday, Sept. 15. WHERE: Rutherglen Close, which runs south of Lakeshore Road, between Murphy and Modeland. TICKETS: Admission free. $10 to register a vehicle.